Silbury Hill, in Wiltshire, is part of the complex of Neolithic monuments, the Avebury Circle, Marlborough Mound and West Kennet Long Barrow. The most recent radio-carbon dating, by the Oxford University radiocarbon unit, yields a late Neolithic date of about 2490-2340BC, with 95% certainty of accuracy. Earlier attempts to date Silbury Hill were based on educated guesses of 2800-2000BC: its form is so unusual there is almost nothing to compare it with. More recently scraps of antlers have found at the summit of the hill. They were discovered by archaeologists studying the gaping hole which had threatened the collapse of the monument. The fragments are the broken tips of the picks with which the monument was built, that were thrown into the top of the hill as the last gaps between the blocks of cut chalk were filled with rubble. It was built in three stages and over a period of probably about 30 or 40 years. The first began in 2600 BCE which makes it contemporary with the megaliths at Avebury and also with the pyramids in Egypt. The mound consists of thousands of chalk bricks forming walls enclosing terraced infill at three levels. The mound was then graded with chalk to give an angle. Quartz crystals found in the surface soil were probably placed to reflect the moonlight and would have created quite a spectacular beacon for miles around. The last phase comprised the building of six concentric steps or terraces of chalk which were then covered with chalk rubble, flints, gravel, and finally soil to form a cone-shaped mound. Each of the six steps was concealed within the overall profile of the mound, except the last one at the top which was left as a terrace or ledge about 17 feet (5 m.) below the summit. This terrace is clearly visible on the eastern side of the mound, but less distinct from the west. While the first phase of building at Silbury may be centuries older, the dating of the antler proves the structure was complete almost 1,000 years before the last arrangement of the boulders at Stonehenge. The hill itself contains about 324,000 cubic metres of chalk and soil, is encircled by a ditch some 5 metres deep and 20 metres wide from which some 170,000 cubic metres of soil and chalk were excavated. It's thought that work on Silbury Hill began in late summer. 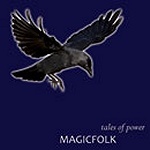 A rough circle would have been pegged out and piles of earth laid inside it to form a mound. The second stage was to build a conical shape on top of the earth mound which consisted of consecutive layers of chalk, earth and soil, while also digging a huge ditch, thus doubling the height. The third and final stage was yet another hill on top of the first and second stages, and also enlarging and enclosing the whole hill to completely cover the original mounds. 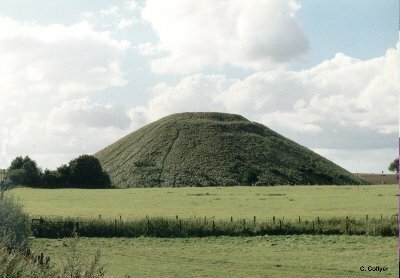 Silbury Hill suffered a considerable amount of damage at the end of May, 2000. Heavy rains caused part of an old shaft to collapse. The shaft is about 100 feet deep and was dug in the 18th Century in an attempt to discover whether the mound contained a burial. Recently, after much campaigning to save the hill, the hole in the mound has been closed with blocks of polystyrene and a layer of chalk, and a seismic study, due within weeks, will show if Silbury is still unstable and in danger. According to William Stukeley, the top of the hill was dug into in 1723 and some bones were discovered together with an ancient bridle. The mound was again dug into in 1776, when a team of Cornish miners led by the Duke of Northumberland sunk a shaft from top to bottom and also in 1849. In 1967, excavations were undertaken by Richard Atkinson but again neither burials nor any clue to the mound's meaning were discovered. Atkinson did learn, however, through radiocarbon analysis that the mound dates to around 2660 B.C.E. 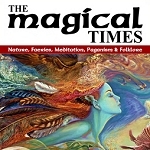 Further evidence from the remains of plants and insects indicated that the structure was begun during the first week in August, probably at the time of the Celtic festival of Lugnasadh, or Lammas, at the start of the harvest season. The real reason for Silbury has been lost in time, and no one knows for sure what the exact purpose it was built for, it has been estimated that it took over 3 million man hours to build. The Devil was making his way to Marlborough with a huge shovel full of earth he intended to dump on the town. On his way he met a cobbler carrying a load of old shoes he was taking to repair. "Old cobbler, is it far to the town of Marlborough? ", asked the Devil. The cobbler had his wits about when he recognised "Old Nick" and replied, "It is a long way indeed, for I have worn out all of these shoes trying to walk there!". Upon hearing this the Devil decided to give up and dropped his shovel full of earth by the road-side forming a huge mound. In this way the old cobbler saved the town of Marlborough thanks to his quick wits. Another variation on the myth states that the Devil was going to empty a huge sack of earth on the town of Marlborough, but was forced to drop it here by the magic of the priests from nearby Avebury. It is also thought of the as the burial place of King Sil (or Zil) a knight in golden armour; said to buried under the mound sitting on his horse of solid gold. 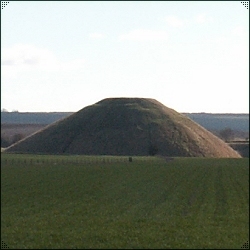 William Stukeley based his theories around Silbury being a burial mound and intertwined that with both Druid and Egyptian myths. This rather bizarre theory which Stukeley arrived at over a period of some thirty years and made public in 1743, is in fact totally without basis. Some people believe that it was built to represent the mother goddess, with the mound symbolising the pregnant womb, the writer Michael Dames has identified Silbury Hill as the winter goddess but he finally acknowledges that the monument remains a stupendous enigma. Moses B.Cotworth, at the beginning of this century, stated that Silbury may have been used as a giant 'sundial' to determine seasons and the true length of the year. The one explanation that seems plausible is that it provided a means of following solar activity, as shadows were cast from it's summit. There is plenty of evidence of ancient Ley lines that link key sites in this area, and Silbury is also at the centre of alignments for straight prehistoric tracks, re-surfaced by the Romans. About a thousand years ago, it is known that Saxons occupied the top of the hill. Other more fanciful explanations of Silbury Hill are that it may have been created as a 'natural earth battery'. Recent excavations have allowed us to discover that the people who created it actually layered it in a three-part process similar to how we would create a battery. Or that it could have been used for landing place for UFO craft at some point.